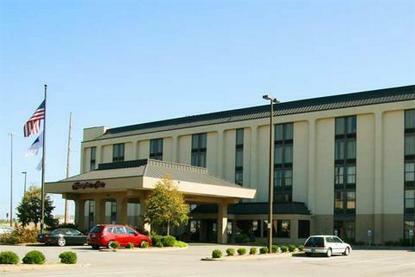 This 143-room Hampton Inn is located in Eagle Crest Commerce Centre on Evansville's bustling east side. We are adjacent to the Cracker Barrel Restaurant and Texas Roadhouse Restaurant. We are located less than 2 miles from major shopping malls and entertainment complexes, and less than 5 miles from area athletic facilities. Our Hampton Inn is known for its large indoor pool and outdoor sundeck. These overlook the adjacent Eagle Lake, with easy access to the lake's 0.5 mile walking trail. We are located at the interchange of Lloyd Expressway and I-164. This is convenient to Indiana businesses in the Evansville-Princeton-Newburgh vicinity, as well as Henderson, Kentucky. For business or pleasure - the Hampton Inn is the perfect destination when in the greater Evansville area.